Mauricio Macri’s victory in Argentina some months ago was treated by mainstream international media and key figures of the global political scene as a major positive development; ‘a shift away from populism’ as the Economist put it. His recent decision to Issue 16.5 billion in bonds to international markets, in order to pay off the so called ‘vulture funds,’ was also heralded as a sign the country was heading in the right direction, supposedly ending its long struggle with debt. But this over-optimist portrayal of Macri’s project often ignores the harsh consequences of his neoliberal reforms, as well as the alarming signs of authoritarianism that are already evident in the way his government deals with political and social opposition. In early April it was revealed that Macri was mentioned in the Panama Papers, something that provoked immediate reactions from the popular sectors. Some weeks later, thousands of protesters rallied against sweeping layoffs and austerity measures. So, despite the initial celebrations, it seems that it might be a bumpy road ahead for Argentina’s new president after all. In a bid to shed more light in the current situation, Giorgos Katsambekis discusses with the Argentinian scholar Paula Biglieri. GIORGOS KATSAMBEKIS: Argentina recently held a general election that could prove quite crucial for its development in the coming years, since Mauricio Macri’s victory marks a point of rupture with the long hegemony of left-wing populism that was established under the Kirchners. Which do you think are the most significant factors that explain this major turnaround in Argentina’s political scene? PAULA BIGLIERI: There are different factors. I’ll mention only two: firstly, Argentinian populism showed an impossibility to absorb the demands generated within its own political context, particularly – but not exclusively – those which were not linked to the element ‘equality,’ the element that structured its own identity and whole set of public polices developed during 12 years. That is to say, some sectors of the popular and urban middle and upper classes, after finding their demands satisfied (such as employment, education, social security, etc. ), slid towards new claims related, for instance, to the unrestricted opening of the markets, the lowering of taxes or sophisticated ways of consumption. And I think this points out the most significant limit of Argentinian populism: the impossibility to undo the neoliberal subjectivity. In other words, many people see themselves as ‘human capitals,’ as units of entrepreneurial and self-investing capital. Therefore, at a certain point, they do not need any more to be part of a ‘people,’ they do not need the State any longer to be backing them. Secondly, the success of Argentinian populism was initially built upon the paradoxical relation between a strong leadership and a set of social movements that where mobilized and gathered in assemblies. However, the satisfaction of their demands together with the growing stale of the government after years of being in power – what in a way also implies frustrations – provoked a tendency to demobilization and the assemblies and the debate tended to decay. If these are the two main factors that explain kirchnerism’s defeat, what do you think are the main reasons for Macri’s success? On what platform was he elected? I think that the key element of Macri’s success was built upon a certain annoyance towards politics. Let us remember that kirchnerism, as a populist project, needed the people’s demonstrations to legitimise the government’s actions pursuing modifications in the status quo. Kirchnerism antagonised with a whole set of actors which represented the neoliberal establishment: the multinational corporations, the IMF, the banks and financial system, the ‘vulture funds,’ the concentrated mass-media, etc. However, the initial enthusiasm of being part of these antagonisms, where the people played a central role, tended to decay after years in power. And Macri promised a change in that sense. During his political campaign (which was anchored in the slogan ‘Let’s change’) Macri promised to keep all the achievements of kirchnerism (to preserve employment, to keep the social programmes, etc.) but, let’s say, without politics or antagonism. 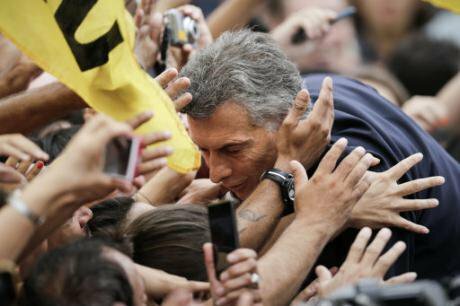 And he also promised to respond to the emerging new demands that kirchnerism could not absorb. For instance, it is interesting to see that in Argentina a recurrent issue, which resurfaces from time to time, is the demand for uncontrolled access to American dollars. This demand is, on the one hand, rooted in social practices developed as a way of keeping the value of income in times of inflation and hyper-inflation. On the other hand, the hoarding of dollars is related to higher standards of living, like travelling abroad, sophisticated consumption, saving in foreign currency or financial speculation. The reactivation of this demand took place while the Kirchnerista government was in the middle of a dispute with the ‘vulture funds’ and faced pressures from the financial system. The subsequent consequence was the association of ‘freedom’ with ‘freedom of the market’ and the concomitant accusation of the government of being authoritarian. Some other demands recurrently raised against the populist government of the Kirchners were the lowering of taxes, inflation, the cut of subsidies, accusations of corruption followed by claims of resignation and the continuous and excessive politicisation of society, and divisive character of the leader, etc. Evidently, these elements were successfully taken by the neoliberal discourse represented by Macri, to articulate its own discursive positions. If this was Macri’s pre-electoral platform, how was it translated into governmental practice? How have things changed in Argentina, since his accession to power, and towards what direction is the country heading now? Clearly what we are politically living today is the emergence of a counter-hegemonic conservative neoliberal project, which is, by the way, quite disrespectful of basic democratic institutions. Let me give you three examples. Firstly, the new government has dismissed thousands of civil servants, accusing them of being either ‘political activists’ (particularly of being ‘Kirchneristas’) or of receiving a salary without the respective working retribution. All these dismissals were promoted by the new Ministry of Modernisation (created by decree), arguing that the decisions were based on ‘criteria of rationality, efficacy and efficiency.’ Many of those who were dismissed have denounced ‘political harassment,’ in the sense that they were interrogated by the new authorities about their political preferences and were required to open their Facebook, Twitter or even e-mail accounts to check their content. Needless to say, firing civil servants for having a political position in a democracy is clearly an act of authoritarianism. These dismissals, in some cases, have also implied the complete elimination of social programmes. For instance, the programme ‘Connecting Equality’ (which reduced the digital education gap by distributing computers for free among students and built digital class-rooms in State schools) or the National Sexual Health and Responsible Parenthood Program. In another case, the dismissals provoked the provisional closure of the Kirchner Cultural Centre (one of the most important and free cultural centres in Latin America) where 600 hundred employees were fired via twitter. Secondly, it is very sad to witness the return of political prisoners in Argentina. In what can be named the first political prisoner of Macri’s government, Milagro Sala a community leader of the indigenous social movement (that supported Kirchnerism) called Tupac Amaru, in the north-western province of Jujuy, was imprisoned by the new neoliberal Provincial Government of Jujuy. This is an institutional scandal that has no precedent in the thirty two uninterrupted years of constitutional life of Argentina. She was initially arrested for peacefully protesting, but subsequently she has been accused of additional crimes – sedition, fraud, publicly instigating criminal activity, belonging to an illegal association – all of which serve to keep her in prison. All these has led The Center for Legal and Social Studies (CELS), Amnesty International and ANDHES (Lawyers for Human Rights and Social Studies in Argentina’s Northwest) to ask that the Inter-American Commission on Human Rights grant precautionary measures to guarantee the liberty of Milagro Sala. Thirdly, journalists – who had a critical position towards the new government or openly supported the previous populist government – were fired from the Public Mass Media System, while others who work in the private mass media have denounced to have been under the pressure of the new government to have their radio programmes or TV shows closed down. Effectively the new government has discharged several radio programmes. This means that freedom of speech is well under threat too. All these measures were taken within a frame of ‘emergency,’ declared in different aspects such as security and statistic emergency. The state of ‘emergency’ in the case of security was called upon to fight against drug-dealing and complex crimes, as well as ‘to put in order’ social protests. In the case of statistics, the state of ‘emergency’ was presented as a necessary measure to put in order the National Institute of Statistics and Census; therefore, for a year we will not have any official statistics on inflation, poverty and unemployment. In practice, the state of ‘emergency,’ amongst other things, allows the government to discretionally spend money avoiding the controlling agencies and budgets. Without pretending to make a detailed depiction or exhaustive analysis, some of the first economic measures – taken during the first month of Macri’s presidency – triggered inflation and produced an enormous transfer of resources from wage labourers to the wealthiest sectors of the economy, particularly the agricultural one. We had a devaluation of the local currency, the elimination of the export tax on wheat, corn and sunflower, and the elimination of subsidies to the rates of electricity, gas and public transport. Some others measures aimed at the deregulation of markets – particularly the financial one – and have directly put Argentina back in the path of indebtedness and therefore under the scrutiny of the International Monetary Fund (IMF) and the frame of austerity policies. Particularly if we consider that the new government has decided to issue one of the biggest public bonds of an emerging market of the last 20 years. This is 16.5 billion dollars to pay the ‘vulture funds’ that were litigating against Argentina. This is strongly contrasting with the previous government that had promoted a UN resolution that was approved in September 2015 against the ‘vulture funds.’ This was a kind of nine points guide to restructure sovereign debt. One last aspect that I would like to mention is that President Macri directly appointed a set of CEOs of different multinational corporations as his ministers. For instance, the Foreign Minister, Susana Malcorra, comes from IBM and Telecom; the Minister of Production, Francisco Cabrera, comes from HSBC; the Minister for Finance, Alfonso Prat Gay, comes from JP Morgan (by the way this Ministry was called Ministry of Economy by the former government); the Minister of Energy, Juan José Aranguren, comes from Shell, and the list goes on and on. However, these significant CEOs designations should not cover up that the new right-wing political coalition is not only an economic project backed by the multinational and the biggest local corporations, but is also a social, cultural and political project that has linked the traditional oligarchic and conservative sectors with urban middle classes and even popular sectors. That is a counter-hegemonic project. And this counter-hegemonic project has dramatically changed Argentina in just a couple of months. In this context, what is the state of the kirchnerista camp today? And more generally, what do you think are the prospects of a Left resurgence in Argentina? The popular camp is undergoing a process of re-articulation at this moment, undoubtedly kirchnerism has a main role within it. Cristina Fernández de Kirchner (CFK) is the most important leader of the opposition, although her leadership is very controversial (as a matter of fact it always was); she awakes love and hate at the same time. CFK called for the re-articulation of a new ‘Citizens Front’ against neoliberalism. Maybe, that is the reason why many conservative sectors of the political arena and the judicial power are trying to put her in jail, under not very clear judicial processes that seem to be more politically created than anything else. Having CFK available for being a candidate in a next election is not good news for the neoliberal and conservative camp. Finally I think that Argentina, after the last populist experience incarnated by kirchnerism and its long historical and political experience in popular resistance, has the chance to be the terrain for the launching of a renewed left-wing populist project in Latin America. Macri, our conservative neoliberal president, has already been the target of three massive mobilizations: firstly, on March 24, the day that we commemorate the last coup d’etat; secondly, on April 13, when CFK was called to testify by the Judicial Power; and thirdly, on April 29 when the five most important national unions demonstrated against the massive dismissals of workers, that we are suffering today both from the public and the private sector. Many other smaller demonstrations that are spread out all around the country reinforce this resistance to the neoliberal and conservative reaction led by Macri. That is the reason why I tend to be kind of optimistic.